On Saturday, 17 March, 2012, the Feast of St. Patrick (Secondary Patron of Nigeria) a special Anniversary Mass was celebrated at St. Andrew’s Church, Ugbighoko, Benin City. It was to recall and celebrate 150 years of SMA missionary endeavour in this part of the Lord’s vineyard. Our picture shows Fr Nwachukwu and Fr Cullinane after the Mass. The Mass took place on the recently-completed foundation of a new church building where a large crowd gathered to rejoice and thank God. The Chief Celebrant was His Grace, Archbishop Augustine Obiora Akubeze, the Archbishop of Benin City. Joining him in the Sanctuary were His Lordship, Bishop Anthony Okonkwo Gbuji, Bishop Emeritus of Enugu Diocese, who preached the homily; Fr. Maurice Henry, SMA, Regional Superior for Nigeria; Fr. Reginald Nwachukwu, SMA, recently-appointed Superior of the Bight of Benin District-in-formation; Monsignor Joseph P. Omesa, Parish Priest of St. Peter’s Church, Benin City; Fr. Bernard Cotter, SMA, representing the SMA Irish Province; Fr. Richard Wall, SMA, Superior, SMA House, Uromi; Fr. Leo Anetekhai, from the Diocese of Auchi; Fr. Augustine Onwuzurike, SMA, the Parish Priest of St. Andrew’s, Ugbighoko, Benin City and Fr. Peter McCawille, SMA, assistant priest at St. Andrew’s. They were joined by more than 50 priests from the Archdiocese of Benin City and beyond. Many of the congregation, both men and women, were wearing the special SMA wrapper which added greatly to the colour and splendour of the occasion. Bishop Anthony Gbuji whose association with the SMA goes back nearly 70 years was inspiring in his homily, in the course of which he traced the progress made down the years in both the pastoral and educational fields, linking the occasion to the role played by St. Patrick in bringing the faith to Ireland in 432 A.D. and finishing his homily by referring to the promising new developments which began in 1986 with the admission of the first Nigerian students into Ss. Peter and Paul Major Seminary to study for the missionary priesthood as members of the SMA. Our picture shows His Lordship, Bishop Anthony Gbuji, first bishop of Issele-Uku diocese and later Bishop of Enugu, preaching at the Mass. Following the Mass there was the launching of a recently-published book, titled ‘We Will Remember Them’, compiled by Fr. Peter McCawille, SMA. The book contains 425 profiles and photos of Bishops, Priests, Brothers and Sisters who worked in Mid-West Nigeria (Dioceses of Lokoja, Benin, Issele-Uku, Warri, Auchi, Uromi and the Prefecture of Bomadi) between 1884-2011 and have since gone to their eternal reward. Their mortal remains now reside in Nigerian soil or in other resting places in various parts of the world. The book took nearly three years of intensive and extensive research before it saw the light of day. As the author states in the introduction: ‘If those memories can inspire you to be an even more committed member of Christ’s faithful in the future the energy expended on its production will have been worthwhile’. 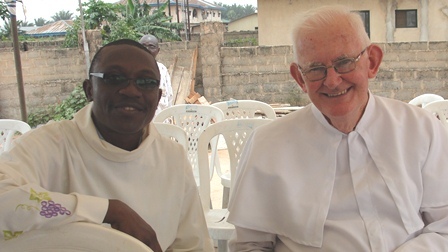 Fr Maurice Henry, SMA Regional Superior for Nigeria (left) with Fr Bernard Cotter SMA, representing the Irish Province at the Celebrations. The interest shown during the launching would indicate that there are many people interested in calling to mind many of those who have gone before us marked with the sign of faith. It was also highly significant to witness the Archbishop himself personally encouraging the priests to make a donation towards the launching on behalf of their parish. At end of the launching the day was brought to a fitting close with everyone invited to participate in lunch. It is hoped that during the next few months similar launchings will be organised in each of the Suffragan Dioceses, in Lokoja, now in the Archdiocese of Abuja, and in Lagos, so that the Bishops. Priests, Sisters, Brothers and people there will also be given a chance ‘to remember them’. Certainly, the 17 March 2012 celebration was a unique occasion filled with hugely significant historical resonances and reminiscences. All those in attendance were moved by the significance of the moment. We thank them all for their commitment and support. His Grace, Archbishop Akubeze of Benin City meets Fr Henry and Fr Cotter.